← Are You Ready for Virtual Trade Shows? Make Connections: LinkedIn’s core purpose is to make connections – either with people you know or people you want to know. If you’re seeking to connect with a journalist, you can request a “linkedin” connection to make an introduction. Rather than send a blind pitch to a reporter, what’s better than a friend making the pitch on your behalf? Research Media: I was recently searching for a reporter to create a briefing sheet and found the reporter’s LinkedIn page. Doh! I can’t believe I didn’t consider this in the past. LinkedIn is rich with information about a person’s background. Leverage LinkedIn to research reporters – where did they work in the past, titles, and other pertinent information. This provides incredible insight before you pitch the reporter as well as to prep your spokespeople. LinkedIn Answers: LinkedIn Answers provides an opportunty for PR to participate in or start a conversation on relevant topics. Certain topics can also show up high on a Google search, which helps if a reporter is searching on a specific topic. In the end, you never know how a reporter gets her inspiration for a story and if she needs sources. What other ways are you using LinkedIn for media outreach? 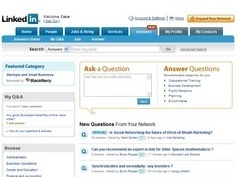 UPDATE: Just saw this post by Lewis Green of BizSolutionsPlus regarding value of LinkedIn. This entry was posted in LinkedIn, marketing, media coverage, media relations, pr, public relations and tagged LinkedIn, marketing, Media Pitching, media relations, pr, public relations. Bookmark the permalink. This mini-series is great! It provides helpful ideas to using new media for business in addition to the obvious social uses. Instead of just making observations about the use of new media, these posts actually serve as a guide. We like it. You can also use linkedin to find bloggers in a particular industry. Use the advance search feature of LinkedIn, then type blog as keyword and, for this industry, you will get all the people in your network that have a blog listed in their profile. Makes it handy to get to know them or to build a list of relevant bloggers for a particular need. I must admit, I’m connected to a few journalists via LinkedIn but I hadn’t even thought about using info from their LinkedIn profiles to help with tailoring and pitching stories to them. Now it seems like such a no-brainer. Thanks for the great tips! I wanted to share the answers so far because it seems to show that PR professionals appreciate the use of LinkedIn to get in touch with them as well. Naymz is also a decent way of connecting. Linkedin’s interface does leave quite a lot to be desired – but then again so did myspace, but then again who uses myspace anymore besides kids?